Those who were holding space at the Fine Arts Building awoke this morning to the presence of about 25 cops, as well as administration. By 9 o’clock, as many of those staying in the auditorium had left for work or class, the cops’ numbers swelled to about 35. The occupiers were outnumbered 2:1, and so decided to gather their things and march out together. The rest of the morning was spent strategizing and covering the Fine Arts Building and the campus with fliers to alert the student body of the previous night’s events. Keep sending in your writings, thoughts, and communiqués to rififi@riseup.net, we’ll be here all night. Our struggle cannot be hung on walls. And don’t forget to come down here to the Fine Arts Auditorium and hang out. Like, right now!! Bring: snacks, caffeine, cigarettes, playing cards, books, ideas, movies, playlists (we need a DJ! ), banner-making materials, and friends! 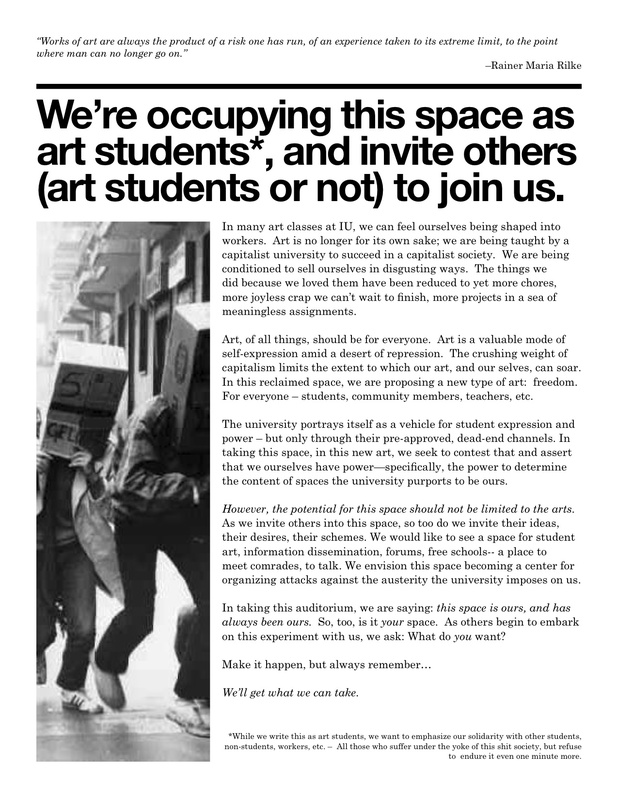 This assembly is called by Occupy IU, but it’s an open initiative. 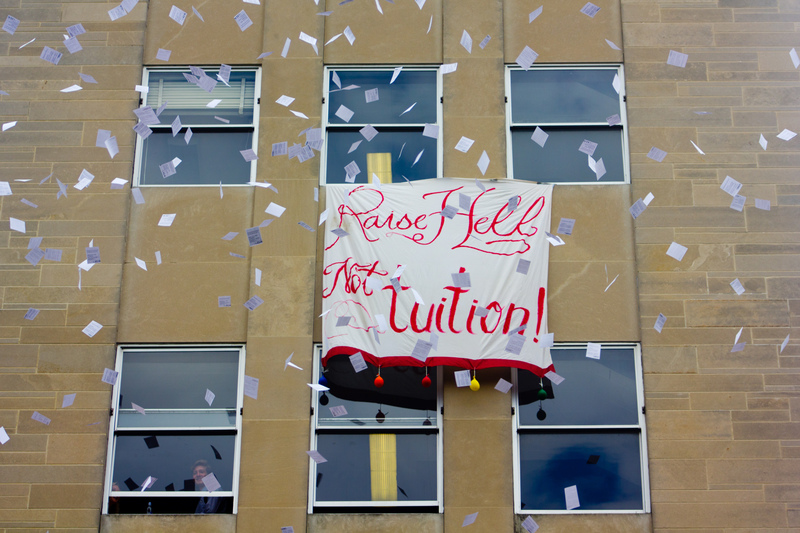 Anyone who wants to organize and take action against campus austerity should come, preferably with their own proposals . The goal is not to create a new organization but to collectively construct a strategy for reversing tuition hikes, rising student debt, privatization, and the campus apathy that enables everything else. In order to launch the kind of campus-wide struggle necessary to transform IU, we want to bring together hundreds of people to speak out and offer their ideas. Not just students, but anyone who works at or uses IU. TONIGHT TONIGHT TONIGHT, 5.30 pm, IU Art Museum Lawn.